Some summer mornings as a kid, I remember inevitably catching some of The Price is Right on TV. Stepping up to the podium to place their bets. Spinning the wheel. Pricing games like "Hole in One." Those are fond memories. 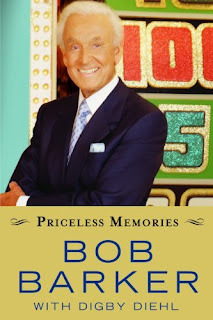 So I decided to give Price is Right long-time host Bob Barker's new book, Priceless Memories, a quick read. I'm not the only one who has these memories. As Bob points out: "If you are 50 years or younger, I have been on national television your entire life." Barker always knew he wanted to be an "audience participation host." In 1956, while hosting The Bob Barker Show on a local Southern California CBS affiliate, he was discovered and ended up becoming the host of the country's top game show, Truth or Consequences. TV (and its many forms of "audience participation") has come a long way since then, but reading this book isn't a bad use of time for a few hours.